With Adobe’s subscription-based Creative Cloud, upgrades to the company’s pro-level video editing and collaboration tools is a continual process rather than a yearly splash. So it’s no surprise that Adobe employs major broadcast industry events like IBC (International Broadcasting Convention) to showcase the most recent updates to the 2014 versions of Premiere Pro and its associated video editing, motion graphics and collaboration software. This year’s IBC, which takes place from September 11-16 in Amsterdam, will see a host of new features and performance upgrades to Premiere Pro, After Effects, Prelude, SpeedGrade, Media Encoder and Audition as well as to the Adobe Story and Adobe Anywhere online services. Taken together, they feature enhanced media and project management tools and services, support for new hardware and tech standards and workflow refinements. 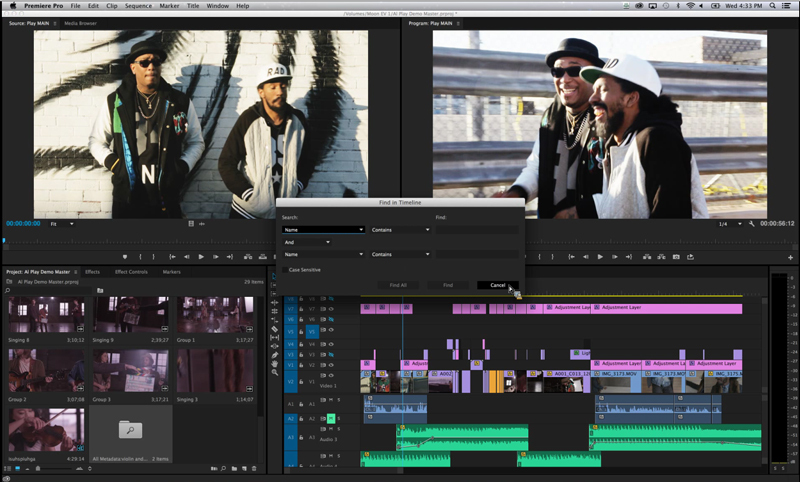 Updated Premiere Pro CC 2014 interface with multi-project workflow and timeline search. Adobe has updated the interface for all its video apps to support high resolution (HiDPI) displays, including Mac Retina Displays and Windows 8.1, providing a flatter, cleaner look. New features in Premiere Pro include advance timeline search, enhanced masking and tracking features, better Consolidate & Transcode features, search bins, multi-project workflows and improved support for the GoPro codec. There’s also native support for 4K, 5K, 6K and higher resolution video, including AJA RAW, Canon RAW, and Phantom Cine, as well as RED and Cinema DNG footage. After Effects now includes Adobe Anywhere full project versioning capability, and an enhanced 3D pipeline allowing artists to work faster with 3D elements. 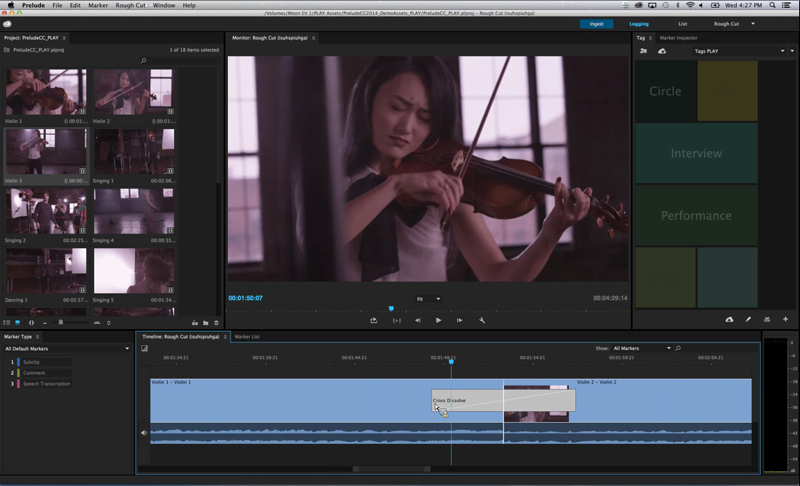 New rough cut dissolves in Prelude CC 2014 join keyboard shortcuts and more. Also look for SpeedGrade‘s new curve adjustments, hover previews, flexible grading layer grouping, audio support and improved direct link to Premiere Pro. In Prelude, users will see the ability to apply transitions across clips in the Rough Cut timeline, keyboard shortcuts for tagging, support for multiple audio tracks, and a Cinema Playback mode. Audition, the sound utility, gets expanded video format support including RED, XDCAM, MXF and others. It also gets iXML metadata support and an improved speech volume leveler. 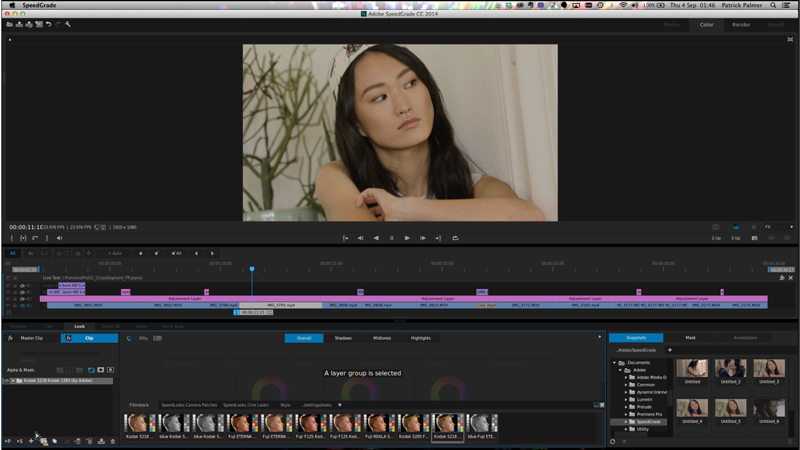 SpeedGrade CC 2014 offers Direct Link integration for Premiere Pro projects, new grading layer groups and more. Updates are also planned for Adobe Anywhere, the company’s collaborative video workflow platform targeted to broadcasters, educational institutions and government agencies. Anywhere helps Adobe’s video suite users to collaborate with centralized media and assets across regular networks. Look for improvements in performance, API enhancements, including access to H.264 streams, and iOS 8 support, including pinch navigate and drag scrub gestures for the companion iPad app. Adobe Story, the online screenplay collaboration tool, gets new text boxes and cards and custom shot numbers to keep shots in order. Media Encoder gets new destination publishing to render and deliver work in one go, intermediate codec support, new formats and more. Adobe will demo the new features at IBC 2014, located at RAI Convention (Hall 7, Stand 7.G27), from September 12-16, and on its website. The updates will ship within the next few weeks.